Ordinary is always boring and even the most seemingly fresh roses of incredibly beautiful shades can get bored. What can I do if I want to please my soul mate, but at the same time I want to make some pleasant and unusual surprise? There is always a way out: exotic flowers! That's what can paint a gray day and make it much brighter and more joyful. What flowers to choose? Not such a large list of quivering exotic flowers, but it does not make them less colorful and beautiful. You can choose the most gentle anemones and freesia, touching the Ranunculus. Quite complex and, sometimes, even weird names for us, for this, we will tell you more about them. For example, anemones are very quivering, tender spring flowers. 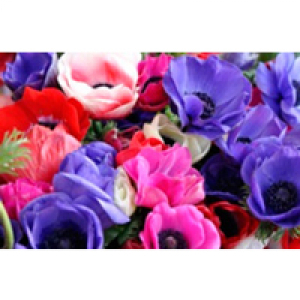 White, red, pink, dark purple small flowers of anemones, so beautifully looking in bouquets! And red anemones are incredibly similar to poppies, as if copies, only reduced and refined. These flowers can be both the main element of the composition, and a harmonious addition. In order for anemones to create a spring mood for you as long as possible, it is necessary to pour warm water in a vase daily and sprinkle them with cold water. But freesias, probably one of the most feminine colors, spring, with a delicate pleasant aroma, just will not leave any girl indifferent! Very elegant, extraordinarily tender freesia flowers add lightness, amazing elegance and charm to the composition. And also fill the bouquet with an incredible aroma. Can be used with other colors in floral arrangements or serve as a full-fledged independent bouquet. Yellow, white, pink, orange, lilac freesia gives a unique sensation of spring. 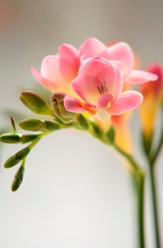 An interesting fact, freesia is used in compositions not so long ago. This, in truth, fragile flower was opened to the world of floristry only in the early twentieth century. Do not concede in their tenderness and Ranunculus. Ranunculus is not the only name of this flower, its second name is known - buttercup asian. These quivering and unusual flowers, when they spread out their buds, become like roses, and when they are fully opened - for a double poppy. Rannunkulyusy look quite harmonious not only in independent bouquets, although the variety of colors of these colors can create very bright and curvy compositions, but also with other colors. There are several types of polynuclei. The most charming is the Ranunculus pyonoid. It is often compared to peonies or roses. He comes from sunny Turkey, where he absorbed the colors of the east. It is known that this flower was one of the most popular in Europe until the end of the nineteenth century. But in Kiev in floristics it is used not so long ago and not so often, therefore, to receive a bouquet of these extraordinarily delicate flowers will be a very pleasant surprise for your second half. And from white and delicate pink Ranunculus, the florists create amazingly tender, quivering and sensual bouquets that will suit the most touching and exciting events and moments in your life, for example, a wedding, the birth of a baby or just a romantic date. But the yellow flowers of the Ranunculus can recharge your cheerfulness and give only positive emotions. 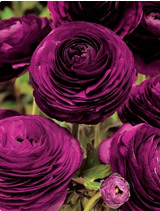 The buds of the pancake-shaped Ranunculus are distinguished by their unusual splendor, and a huge number of shades make these flowers necessary for creating voluminous compositions. This flower looks harmoniously in bouquets with roses, anemones, chrysanthemums. It helps to make the composition more airy, tender, original and truly refined.